Drug Safety is the premier international journal covering the disciplines of pharmacovigilance, pharmacoepidemiology, benefit-risk assessment and risk management. Drug Safety’s structured program of peer-reviewed invited articles ensure comprehensive and critical coverage of all topics. The journal specializes in definitive reviews on the epidemiology, clinical features, prevention and management of adverse effects of individual drugs and drug classes. Benefit-risk assessments provide an in-depth review of adverse effect and efficacy data for a drug in a defined therapeutic area. High-quality original research focusing on the clinical implications of drug treatment safety issues is also published. 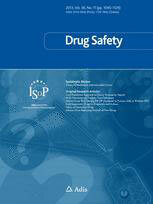 Drug Safety is published by Springer. Recommendations of a joint ISoP-ISPE group on the guidelines for the submission and publication of adverse drug reaction reports. This paper is published simultaneously in Drug Safety, ISoP’s official journal, and in Pharmacoepidemiology and drug safety, ISPE’s journal. The content of this paper represent’s ISoP position, and not only its authors’.